William Golden Henshaw3,5 [William G. Hinshaw6, Golden Henshaw1,2,7,8]. Hinshaw, William G., step son, age 6, born in Tennessee; parents born in Tennessee. 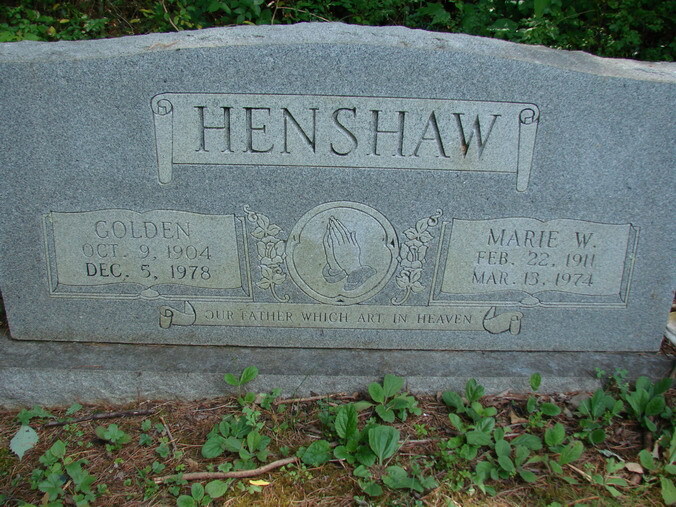 Henshaw, Golda [unclear], head-of-household, age 26, born in Tennessee; parents born in Tennessee; first married at age 20; owned home ($500 value); no radio in home; occupation: farm labor, farm; not a war veteran. 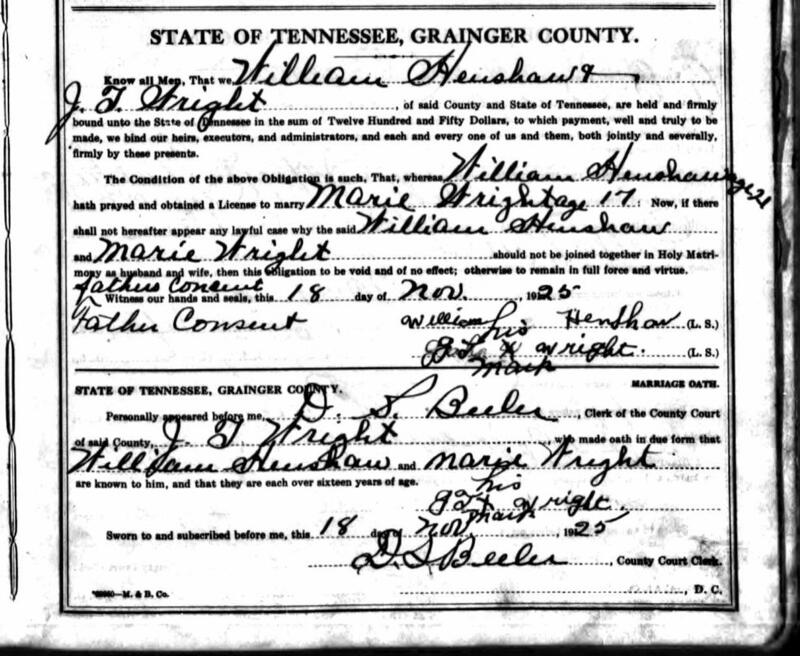 Henshaw, Marie, wife, age 20, born in Tennessee; parents born in Tennessee; first married at age 15. Henshaw, Willie, male [sic], son [sic], age 2 years 8 [unclear] months, born in Tennessee; parents born in Tennessee. Henshaw, Golden, head-of-household, age 35, born in Tennessee; completed 3rd grade; on Apr 1 1935 was living in rural Knox County, Tennessee. Henshaw, Marie, wife, age 29, born in Tennessee; completed 4th grade; on Apr 1 1935 was living in rural Knox County, Tennessee. Henshaw, Willie F., daughter, age 12, born in Tennessee; completed 5th grade; on Apr 1 1935 was living in rural Knox County, Tennessee; attended school. Henshaw, Sam Thomas, son, age 8, born in Tennessee; completed 1st grade; on Apr 1 1935 was living in rural Knox County, Tennessee; attended school. Henshaw, Carrie Lou, daughter, age 6, born in Tennessee; completed 1st grade; on Apr 1 1935 was living in rural Knox County, Tennessee; attended school. Henshaw, Frank, son, age 2, born in Tennessee. 1930 census, Civil District 13, Knox County, Tennessee; roll T626-2260, ED 90, page 23A, line #41, dwelling #440, family #440. 1940 census, Mascot, Civil District 13, Knox County, Tennessee; roll T627-3910, ED 47-37, page 18A, line #35, household #290. Contribution from Glenda Kay (Henshaw) Ward. Obituary of Sam Thomas Henshaw. 1910 census, 3rd Civil District, Grainger County, Tennessee; ED 58, page 3A, line #26, dwelling #51, family #51.